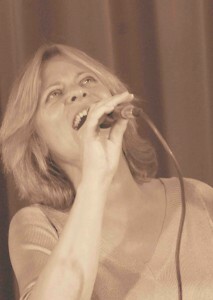 After singing jazz standards for more than two decades as Yvonne de Kok, she changed her artist name into Yvonne Walter (her mother’s name) and started to record her own compositions. On stage she merges jazz standards with her own songs and with today’s composers like Ivan Lins, Johnny Mandel and works of the hands of talented friends. Yvonne Walter was born in Eindhoven, a town in the southern part of the Netherlands. She started studying piano at the age of seven and in her teens, she performed as a singer in high school bands. At that time she started to compose songs. Yvonne lives in Antwerp, Belgium. Yvonne likes to work with different accompanists to keep the real jazz spirit high. Although she will not avoid arrangements, which are necessary for a larger band, she prefers the challenge of a fresh rendition in duo, trio or quartet in which her only demands are tempo, rhythm and key.